It’s still cold outside! Let’s cozy up with some soup and trust that warm spring weather is on its way. If you enjoy bean-based chili recipes and tortilla soup, you are going to love this pinto posole. 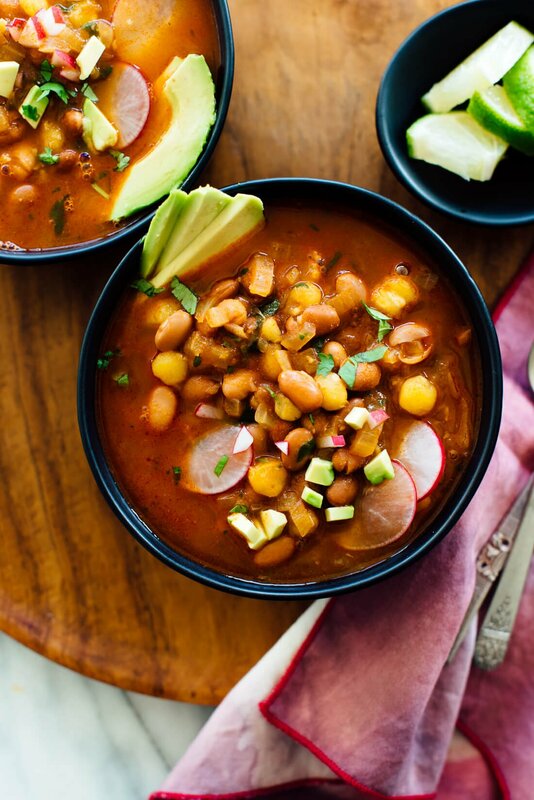 I traded pinto beans for the pork you’ll find in traditional posole recipes, so this stew is vegan. It’s also hearty, spicy and delicious. You’ll just need one pot for this stew, and I opted to use canned beans to cut the cooking time down to about 30 minutes. Leftovers taste even better the next day, and this dairy-free recipe freezes great for later, too. Posole, pronounced poh-sOH-lay, is a Mexican stew that typically features shredded pork, dried chilis, hominy and cumin. In Mexico and New Mexico, it’s often served on celebratory occasions like Christmas or New Years, but it’s great on any chilly day. My variation with pinto beans instead of pork is not quite authentic, but it’s full of redeeming fiber and protein. It straddles the line between a soup and a stew, so I’m using those words interchangeably here. Hominy is a variety of dried corn (maize) kernels that have been treated with an alkali, such as lye, to improve digestibility. You buy it dried or in cans, in a well-stocked grocery store (check the international aisle or look near the canned corn) or Mexican grocery store. I used canned corn for this recipe but you could substitute freshly cooked hominy, too. I’ll never forget the first time I tried guajillo chili-based enchilada sauce. Life changing! Guajillos offer a deep, intriguing mild-to-medium spice factor, unlike fiery-hot cayenne. You’ll find dried chilis in a well-stocked grocery store (again, check the international aisle) or Mexican grocery store. Use two chilis for mild soup, or four for spicy soup (I like my posole spicy). Since the seeds contain the most heat, you’ll remove those before briefly toasting the chilis against the pan. If you want extra-spicy soup, you could even reserve those seeds to add after the soup is cooked, to taste. I simply cooked the soup with the chilis and then discarded the chilis at the end. I just read a Bon Appetit recipe that suggested puréeing the simmered chilis with some broth and pouring the mixture back into the soup. You could try that if you want extra-rich chili flavor and don’t mind busting out the blender, but add the purée to taste instead of pouring it all in at once. 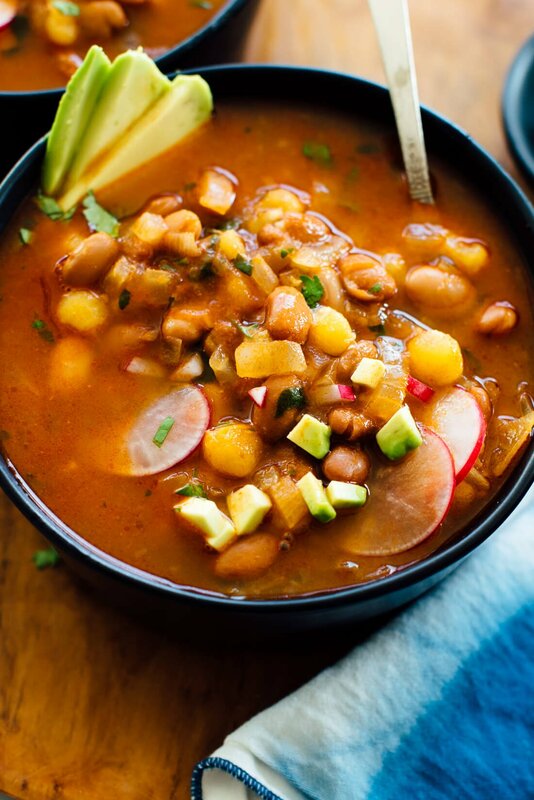 This hearty vegan posole is made with pinto beans instead of pork! This easy Mexican posole recipe is healthy, spicy and delicious. Leftovers taste even better the next day. Recipe yields 4 bowls. Cut off the stem ends of the chilis and shake/flick the chilis to remove as many seeds as possible (it’s ok if some remain). Rinse them and pat them dry. Heat an empty Dutch oven or soup pot over medium heat until a few drops of water evaporate quickly from the pan. Toast the chilis in the dry pan, pressing them flat with a spatula for a few seconds until fragrant, then flip them over and press them again for a few seconds. Remove the toasted chilis and set them aside for now. In the same pot (still over medium heat), warm the olive oil until shimmering. Add the onion and a pinch of salt. Cook, stirring often, until the onions are tender and translucent, about 5 minutes. Add the garlic and cumin and cook until fragrant while stirring, about 1 minute. Add the tomato paste and cook, while stirring, for 1 minute. Add the toasted chili peppers, bay leaf, hominy, beans, vegetable broth and water to the pot. Stir in ½ teaspoon salt and raise the heat to medium-high. Bring the mixture to a simmer, then reduce heat as necessary to maintain a gentle simmer, stirring occasionally, and cook for 25 minutes. Remove the chili peppers and bay leaf from the soup and discard them. Stir the cilantro and juice of ½ lime into the soup. Taste, and add more salt (I usually add at least ¼ teaspoon more) and/or lime juice if necessary. For extra richness, add a little splash of olive oil and stir it in. Cut the remaining lime into small wedges. Divide the soup into bowls and garnish with lime wedges and other garnishes of your choice. *Pepper note: Use 2 peppers for mild soup and 4 for spicy soup (I like my soup spicy). If you want extra-spicy soup, you could even reserve the pepper seeds to add after the soup is cooked, to taste. If you can’t find guajillo chili peppers, dried ancho chili peppers are a good alternative. Or, use 1 tablespoon mild chili powder instead—start the recipe with step 3 and add the chili powder with the garlic and cumin. Change it up: For more color and textural variation, substitute one can of black beans for one can of pinto beans. For extra pepper flavor and color, sauté a chopped red bell pepper and/or jalapeño with the onion. It’s definitely still cold outside! We’ve been lucky with some Spring temperatures in the afternoons, but the evenings are still chilly and this looks like the perfect dinner for that! It is and I’m not a fan! But this soup it perfect, I agree Alice. This looks delicious! To clarify, you’re using dried guajillos not fresh, correct? I make vegan posole every Christmas and love it! The addition of pintos is a good idea; I’ll have to try it. As a point of clarification, hominy is not made using lime juice, which is actually acidic, not alkaline. Instead it’s made with the mineral lime or lye. This sounds great! I wonder what it would taste like if I substitute jack fruit for the pork? I plan to try it both ways. Interesting! Let me know how it works with the jack fruit, Linda! Hi Kate, this recipe looks delicious! Is there a substitute for the chili peppers? There’s an asterisk next to them in the recipe, so I was hoping there was someone else I could use, but I don’t see a substitute listed. Thanks for all your creative, vegetarian recipes – I cook something different from your website / cookbook every week for meal prep! Hi Kate, I’m confused. I don’t know what this is: 2 to 4 guajillo chili peppers* – and I don’t seed another asterisk? Is there a substitute? Thank you! I can’t wait to make this! Hi Suzy, I’m sorry, I’ve fixed that note now! Hooray! I love that your toddlers love it. Thank you, Judy for sharing. This may be my new favorite Posole recipe! Easy to make and very tasty for a dish without meat. I used my instapot as the one pot and followed the recipe to the letter until time to simmer and instead used the manual until pressurization then turned if off and let it depressurize then ate. Thanks for sharing this most creative and yummy dish. I’m glad you like it so much, Dale! I appreciate the review. I used this Instant Pot technique but cooked at pressure for 5 minutes and never added the 2 cups of water since less water evaporates during pressure cooking. I also pureed the peppers with some broth and added the entire thing back to the pot without thinking it was too spicy (but I do love spice). Obviously, keep testing as you add more of the pepper mixture. Delicious! Ingredients list two cups water but instructions don’t say when to use it. Definitely puree the chilis after they’re cooked and return them to the soup. It’s more authentic this way. I’m a new vegan and have loved your recipes. This one is at the top of my list. I’m sorry, EB! I’ve fixed the recipe. What a great idea swapping pinto beans for the pork. Can’t wait to try it. Sounds delish! Let me know what you think, Kerry! I have a question – in your ingredient list you call for 2 cups of water but I do not see where you use it in the directions. Can you clarify? I’m sorry about that, Kristin! The water is added with the broth. I’ve corrected the recipe. The recipe lists 2 cups of water, but I don’t see it in the directions and looks like mine would be too watery if I added it. Did I miss a step? In step 4. Add the water, along with the broth. Hope this helps. I am eager to put more vegetarian cooking in my repertoire and your recipes are so delicious! Thank you! 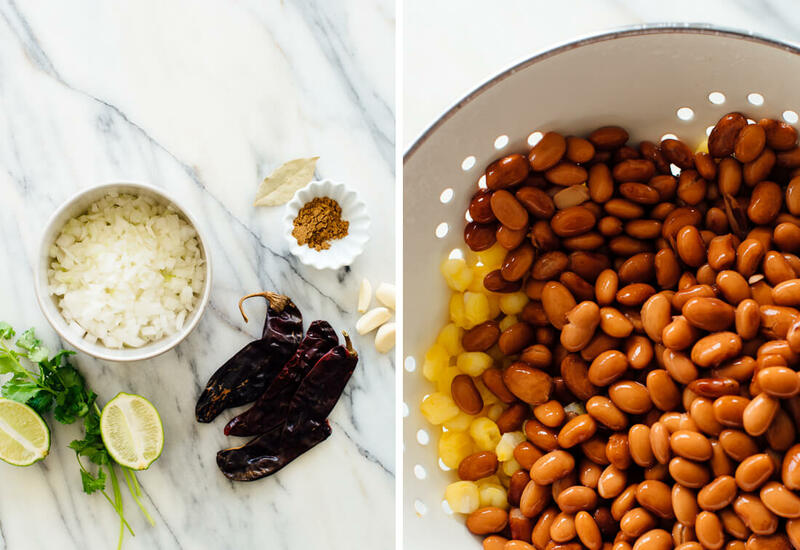 Just one question – recipe for pinto bean posole lists 2 cups of water as ingredients. Is this in place of the vegetable broth? I’m excited for you to try more recipes too! You add the water and the vegetable broth to the pot. I hope this helps! I’m making this now, and though you mention 2 cups of water, you don’t say in the instructions what happens to the water. I’m going to add it to the cooking soup, and I hope it doesn’t make everything too watery. Please fix this if you have indeed omitted the a step. Thanks. You will add water and vegetable broth to the pot – see step 4. I hope this helps! Nothing is better than a cozy stew like this on a cold night! This is amazing. Right before serving, we mixed in a few chunks of avocado and some sliced radishes. It’s so good. Just starting to get cold here in Oz! This will be perfect. Made this tonight–ended up blending two of the cooked chilis w/some broth and adding it back into the soup. Just fabulous, everyone loved it vegans and non-vegans alike. Thank you, Kate! I also make with little variation like by adding readymade paprika and black pepper for spice. Made this last night exactly per the recipe except substituted 3 New Mexico chil peppers for guajillos, which my store did not have, and added an orange sweet pepper with the onion as you suggested. Added the water along with the broth. It was so very easy and quick for such a flavorful, delicious dinner! 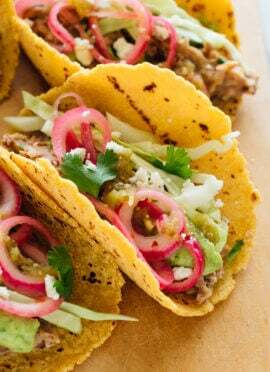 The complement of crunchy cabbage and radishes along with avocado, cilantro and lime juice toppers made for terrific texture. We cook with your recipes several times a week and this one goes to “favorites” on our recipe index! Great! I love that, Cathy. Thank you for your comment and review. A great way to work with what you have, for sure. I made this last night, accidentally leaving out the two cups water as it didn’t show up in the recipe instructions. It turned out great imo. I imagine it would just be a bit thinner with the water, but it wasn’t overly thick to me so I think either way provably works deliciously! Sorry about that! You add the water into step 4 with the broth. It’s there now :) But, I’m glad it was great for you still! I’m sorry you were disappointed Anne! But, I appreciate you trying the recipe. I have update the recipe to be more clear for where the water needs to be added (see step 4). If you cooked your beans separately, it shouldn’t be too different. Thanks for following up, Anne! This recipe is kind of hard to categorize, which is why I called it a “soupy stew,” for lack of better descriptor. :) Check my recipe notes for some ideas on how to change this one up! Made this last night and all 4 members of the family LOVED it! A 10/10. Win! Thank you, Kathi for sharing. We made this on Saturday night since it’s still freezing in MD, and it was the perfect warm-up. 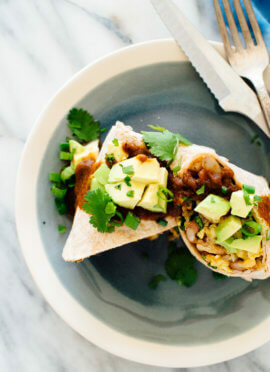 Subtly spicy, filling, and so yummy with all the extras on top! That’s great! I’m glad it was just what you needed to warm-up. But, come on Spring! Shortly after making this delicious dish that the whole family enjoyed, I was asking my six year old son about his favorite food. He quickly replied, “That dish you made!” (Pinto Posole). Thank you for this and all of your wonderful recipes! Hooray!! That’s awesome. Thanks, Mariah for sharing. Delicious!! I couldn’t find guajillo chiles so I a combo of chipotles in adobo sauce and ancho chili powder and smoked paprika and some 85% chocolate. Also cut back a little on the liquid and served over cornbread. Loved it! Perfect! Thank you, Joanne for the review. Made this last night. Lovely!! Found the chilis in a Mexican grocery store, which was a delightful experience in itself. :) I swapped one of the cans of pintos for black beans, and sprinkled in some lentils. Make it. It’s wonderful! I couldn’t find dried guajillo peppers so substituted anaheim- turned out great for someone like me who doesn’t like spicy food. Anaheims are not spicy at all. However I did wish it had more chili flavor, so I pureed both my chilis with broth and added back in- perfection, and still not spicy! Thanks for another amazing recipe! Way to substitute, Susan! Thanks for sharing. I made this last night here in chilly London and it was great! I did not have hominy, so instead I stirred in 1/3 cup of Polenta into the soup during the last eight minutes of the simmering stage. It added a nice texture. I also added a big scoop of avocado hummous to the top of it. I used three dried guajillos and the spiciness was just right for me. If I make again, I will use less tomato paste. Thank you, Steph for sharing. I appreciate the review! Thank you for this recipe, the pesole is delicious. I used vegetable stock instead of broth & let it simmer for an hour. So good! Will definitely make it again! You’re welcome, Barbara! Thank you for your review. I bet the extra time really made the flavors come through. This was fabulous. Could not find peppers so I substituted 1 Tbsp of chili powder, as you recommended. Can’t wait to have the leftovers for lunch! The flavors were delicious in this! It wasn’t as spicy as I would have liked so I added some red chili pepper flakes to add some zing. And I added a bunch of kale for color + substance. That work! Thank you, Kay for the review. I have wanted to make posole “forever,” and was really happy to find your pinto bean-based recipe. Made it with two guajillo chiles, which provided just the right amount of heat for us. It was delicious! I served it with warmed corn tortillas and a green salad with avocado-cilantro dressing. Gave some to my neighbor, too, ‘cause it’s definitely good enough to share :-). Thank you! Great! I’m glad it was just what you were looking for and that you felt is was great to share. Love hearing from you! Kate does it again! Seriously, I’ve never made a bad recipe from this blog or from her cookbook! This soup is especially delicious. Even though the weather is warming up in Northern California, I still can’t wait to go home and eat the leftovers of this soup. I made it exactly how the recipe was written, and used 2 guajillo peppers. Next time I might crank it up to 4 to increase the spice. I topped the soup with a bunch of avocado and it was fantastic! Ha, you’re sweet! I’m glad you like it so much. Thanks for stopping to say so and for your review! So good – made for lunch tomorrow. Can’t wait! 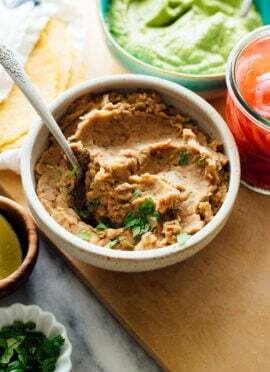 I too have fallen in love with pinto beans! Thank you! I know, pinto beans are so great. I can’t get enough! Are you using dried guajillo peppers, or are you finding fresh ones? I do see in your comments someone reconstituted dried ones. I make posole with pork quite often because it is one of my favorite dishes ! I saw your recipe and knew right away I wanted to try it and it did not disappoint – it is very good – I will make it often since it is healthier than the pork posole! I’m glad you tried it, Janet! Thanks so much for the review. I made this last night for a friend who grew up in New Mexico, land of authentic posole, and has high standards for such things. We all really enjoyed it. I blended the chilies and added them back in, added more hominy, and a pinch of cayenne and it was delicious. Next time, I think I might add a few more chilies but otherwise, this recipe is very good as written and is going into our regular rotation. Hooray! So happy to hear that, Sarah. Thanks so much for sharing! Wonderful recipe! Because of issues with tomatoes, I substituted an equal amount of canned mango-peach salsa. Don’t know if it tastes like “real” posole, but I love it. Thanks for your review, El! It looks too delicious.You Really nice work on it.Sweet potato chunks, hominy and pinto beans are simmered in smoky, spicy broth to make this warming vegan posole. I made this last night for dinner and it was delicious! I didn’t have any guajillo chili peppers so I used Kate’s substitute for chili powder. Also, I misjudged my pantry and had to substitute a can of kidney beans for one can of pinto. Both alteration came out great. My husband was a big fan too and said I should make it again. I’m glad you enjoyed the chili powder version! Thank you for you review and comment, Allison. I appreciate it! This recipe was just what I needed today in Colorado….it turned cold overnight! I followed it exactly, just switched a few peppers for some local options and it was still super delicious! I added all the toppings, radish, cilantro, avocado, green onion, and a little poblano pepper. I’ve already boxed some up for some friends to try too. Delicious!! Great to hear this was just what you needed! Thanks for sharing, Mande. I bought Pinto beans from NutriSmart, not canned. Can I use these? Hi Lisa! Sure. You will just want to make sure to cook them prior adding to the soup. Then you can follow the same steps. It will of course add additional time. I made this last night, and it was quick and delicious! A perfect weeknight meal. Made with chili powder since I couldn’t find the peppers. Easy and delicious! Made this for dinner last night using one tablespoon of chili powder instead of the peppers and it turned out great! I will definitely be making this on a regular basis now that the weather has turned cold. I have a Cookie and Kate binder that I put all my favorite recipes in and I have yet to be disappointed; also have your cookbook. Keep up the good work!! That’s great! I appreciate you saying so, Eleonore. I do a lot of testing to make sure they are up to expectations! I’m not much of a commenter, but I had such a bad cold/flu last week I ended up home for the day. This is what I made as my “feel better” soup and it was just perfect. I’m thankful you shared what you thought and that you are feeling better! I appreciate it Maria. Take care! While not the same as what I grew up with, this recipe was delicious! My hubby has recently gone veg and our old recipe (with chicken, not pork) went out the window. My try turned out really thick (almost like chili) but the flavors were really robust; nicely layered and delicious. I actually used fresh-made beans (dry beans, water, and veggie bullion) a’la the good old Instant Pot (no soaking, 1 hour to make! ), and added the blended the chilis at the end. SO GOOD! The only spice edit I made was to add a generous amount of oregano (2-3 TVs., dried). The posole I grew up with featured it heavily and works well with the flavor of the bay leaves. Next time I’ll add some cubed chayote squash, too! I’m glad it was still good even though different than what you grew up with, Elliot! Thank you for this wonderful recipe! Even though I couldn’t find the peppers making it with just the chili powder worked really well! Definitely making this again! Great, Nina! I’m excited you liked it! I cook for a vegetarian family and use your recipes more frequently than any others. The family loves everything I make, and I have you to thank for it! I’m excited to hear that, Lauren! Thanks so much for your comment and review. Have a wonderful day! This is my new favorite recipe. It is the perfect comfort food. I make it with mango salsa instead of the tomato paste, and it is amazing. Tried pureeing and adding the peppers back into it one time, but it was way too hot for me. However, putting crushed hot tortilla chips into a bowl of the posole is delicious. Oh that sounds interesting! Thanks for sharing, El! Didn’t make this earlier because I didn’t think I’d find guajillo peppers or even posole necessarily, but I went to a large grocery store near where I work and found both items in the Mexican section (peppers were dried) so I prepared this and it was terrific! I used three peppers but could probably have safely used four and added avocado as garnish. The lime was a key ingredient. Husband loved it too. We’ve both used posole before. Thanks Kate. Love that you finally made it and loved it, Heather! Thanks for sharing! I rarely leave comments but thought I would for this recipe. I have enjoyed many of your recipes and this one did not disappoint either. I made a couple of variations that readers may find helpful. I made this in the slow cooker. My slow cooker has a saute function so I was able to toast the chilis and then saute the onions directly in the pot. I followed the recipe as directed and cooked on low for only 2 hours and then left it on keep warm for several more until it dinner time. The flavors were able to mingle during those hours. I also used a mix of guajillo and pasilla peppers as well as the addition of one chipotle pepper in adobo sauce. The depth of flavor from the chilis cooking in the sauce was delicious. This will be added to my regular rotation. I’m glad you liked this one too, Melissa! I appreciate you sharing your approach. Thanks for your review! I cook in a private household for a vegetarian family of 4 and have tried more than a few of your recipes out on them with great success. They (and I) LOVE this soup. The first time I made it, I followed the recipe pretty much exactly and it was wonderful. The second time, I followed your suggestion below the recipe and sauteed a chopped red bell pepper and a minced Serrano chili with the onion. I used 2 cans pinto beans and 1 can black beans. I also used only vegetable stock (6 cups) instead of 4c of veggie stock and 2c of water. I know its more cost effective to only open 1 32oz container (if using store bought), but i use vegetable stock daily so having 1/2 a container in the fridge is not an issue. Also, the Hominey I can find in stores only comes in larger cans than 15oz. (I think they are 24oz). I use it all and it doesn’t overpower the dish. Thank you for sharing your truly wonderful/delicious recipes! I’m glad this is a favorite, Lauren! Thanks for sharing your variation, too. Another delicious recipe! Thank you Kate, we’ve loved every recipe of yours that we tried! I love that! Thanks for sharing, Troy. If you would like to leave a star review since you liked this one so much, I would appreciate it! Just had this and all three of us think it’s fantastic! We substituted anchos since we could finding guajillos. Because we don’t like our food too spicy, we discarded the peppers when we removed them from the pot, but next time we will puree them and return them to the soup, as it was just right for us with 2 peppers. This is our second big hit from this site (the lentil soup was also incredible). We warmed tortillas on the side and dipped them in the posole. Thank you for this recipe! I’m glad you all loved this soup, Paul! Thanks for sharing your experience. Loved this! So tasty. I used freekeh instead of hominy, which doesn’t exist in this part of the world, and it was divine. I made this tonight and was wondering about removing the guajillos after cooking (my first thought was to toast then grind to a powder) – came here and saw the comments about taking them out and blending them and adding back to the stew. Great idea and it thickened it up a little which works for me. Instead of the pintos I used half anasazi and half black beans (I was out of pintos, for some reason). This is a fabulous stew and will be going into rotation. I ate three bowls. It was delicious! I never added the water and I was generous with the olive oil. I loved it. And my meat-loving boyfriend loved it too! Thanks, Kate! I love it! Thanks for sharing, Kim. absolutely great soup with great flavor! You’re welcome, Quinton! If you would like to leave a star review since you loved it so much, I would appreciate it! My family and I LOVE this recipe! My husband could literally eat it everyday. Thanks for such a delicious veggie version of this classic! Brilliant! But you don’t list that alternative option in the recipe. Hi Carol, thanks for pointing that out. If you’re cooking your own hominy, you could add about 1 1/2 cups cooked instead of canned. I made this and everyone loved it. I think it is the tomato paste that adds a unique flavor. My store did not have hominy (New England), so I just added a can of corn niblets, and they were great. I made some skillet cornbread, and it was a wonderful, meal. This is really good! We added a jalpeno as the peppers are mild. Avocado as garnish is a must! Really a great recipe! I added and extra can of hominy as I like its texture. Wonderful flavor. Next time I will puree the chilis after removing them and slowly add back to taste. Definitely a keeper! Wonderful, Roger! Thanks for sharing. Subbed some jackfruit for one of the cans of beans and added bell peppers – so good! Fantastic recipe. I found the guajillo peppers at the local Mexican market, and they added such a fantastic flavor that it was definitely worth making an extra stop. I served the soup with corn tortillas heated on a griddle with a little salt and oil, which was a nice complement to the hominy in my opinion.My wife isn’t a fan of spicy foods and she loves this soup (I only used one of the guajillo peppers). Delicious! This is one of my very favorite dishes! So good and great for leftovers. Knocked this one out of the park Kate! I made this, and I don’t know if I bought an off brand of the hominy or what. I didn’t recognize any of the brands. Maybe I just don’t know what hominy is supposed to taste like. It didn’t taste like corn to me and it had a really gummy texture. I liked the flavor of the soup, but the hominy was a bust. I’m sorry you didn’t love it. You can always use corn instead of the hominy if you like! Love, love, LOVE this recipe! It was one of the first dinners I made after we adopted a vegan lifestyle, and six months later I’m still making it at least once a month. 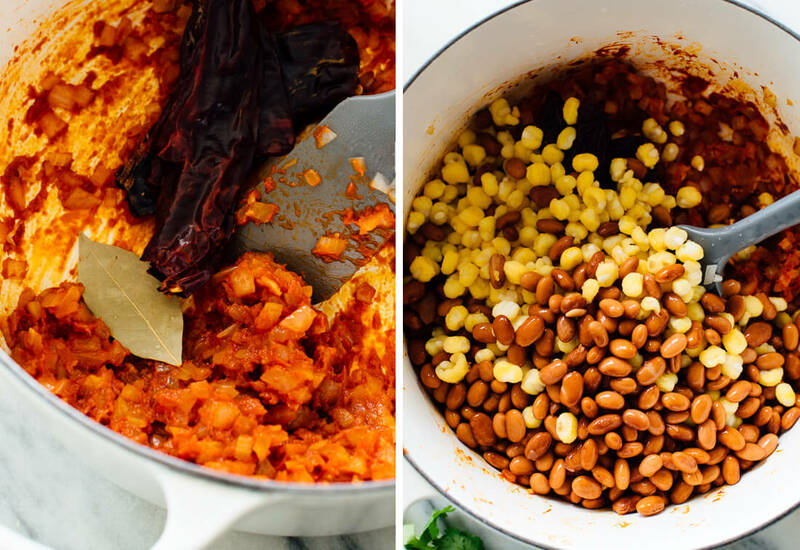 Over time I’ve made some small changes (e.g., I use dried beans and just throw everything except the hominy in our Instant Pot), but overall it’s basically as you have it here. Makes awesome leftovers for lunch. This was soooo good! 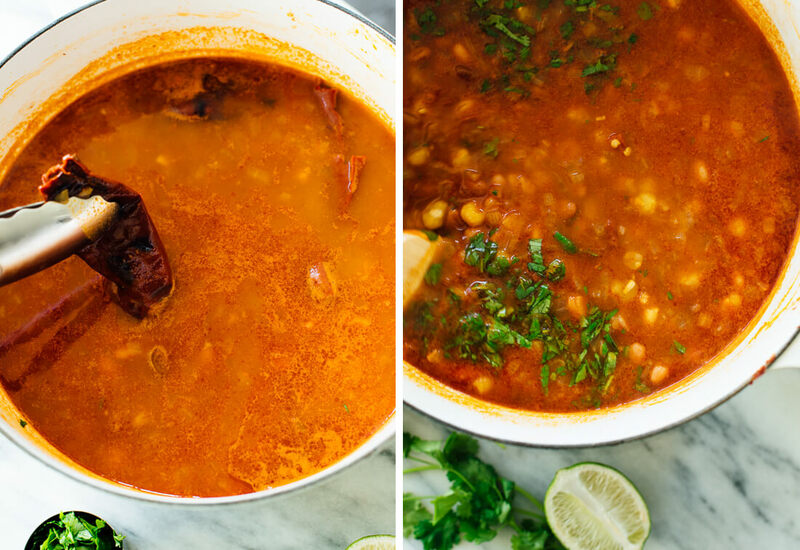 Back in my meat-eating days, my family and I had an amazing traditional posole while visiting friends in Guadalajara, Mexico, which we tried many times to replicate but never could quite get it right. This version captures the flavor perfectly- and honestly, I like the bean version better! Everything I’ve ever made from either your blog or your cookbook has always come out delicious- thanks so much for always being a consistent source of food inspiration. I’m glad this one measured up, Beth! Thanks for your review. Searching for a meatless posole recipe, this one came out on top of the search. And am I glad it did. This tasted fantastic! I followed the recipe exactly, substituting one can of black beans for pinto beans as suggested here. The guajillo chiles are indeed life (in the kitchen) changing. Will probably try the Bon Appetit method of making a chile puree next time. Thinking of perhaps skipping the water next time as the ratio of liquid to beans & hominy seems a bit much. Thoughts? Thanks so much for your time and effort in creating this dish, and a special thanks for creating smiles and happiness for so many. Means a lot in this day & age! You’re welcome, John! I like the ratio as stated in this recipe best, but feel free to adjust to your liking. Thank you for your review! Making this for the 3rd time in the last 6 months since I found this recipe. Absolutely love it! I’m excited you love it, Jen! Thank you for your review.